between both gender and race in state agencies. The task force will be comprised of experts from across the state who will combine their extensive experience and knowledge to conduct this investigation and provide recommendations to ensure Texans receive equal pay for equal work, regardless of gender or race. “The founding promise of our great nation is that all persons are created equal, and should be treated equally under the law. Unfortunately, despite decades of advancement and perseverance, the pay gap between men and women is still a wide gulf — with women earning only 80.5 cents for every dollar that a man makes, and women of color often making even less. I have filed H.B. 761 to create the Texas Pay Equity Task Force in order to fully gauge the depth of this problem as it exists in state government, and to make recommendations to the legislature and state executive leadership on how to adequately address this inequality. of the City of Houston. 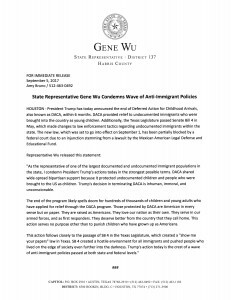 AUSTIN, TX – State Representative Gene Wu (D-Houston) has filed H.B. 760 to defend consumers against the increasing scourge of package thieves — commonly known as “porch pirates.” This legislation would increase the criminal penalty for stealing packages addressed to a victim and from the steps of a victim’s home. Currently, package theft is only prosecuted as a Class C Misdemeanor ticket or as a Class B Misdemeanor, like shoplifting. “Package theft has been on the rise in recent years due to the increased market share of online shopping and home delivery services. Despite frequently having clear videos documenting the theft, these acts often go un-investigated, and the offenders go unpunished. I hope that this legislation can encourage prosecutions and deter would be thieves who don’t think the police would ever bother. As a lawmaker, I am always hesitant to increase criminal penalties, but this is a different situation. The current law is based on the value of the property stolen and not the nature of the theft. The value of most day-to-day deliveries would garner no more than a simple Class C ticket for the theft, and as such, law enforcement may be reluctant to spend scarce resources to track down a thief, and to issue a ticket. Additionally, stealing packages from a victim’s own home is much more of a personal violation of a victim than compared to stealing a six-pack of beer from the gas station. State Representative Gene Wu is serving his fourth term in the Texas House of Representatives. He represents House District 137, which includes the southwestern portions of the City of Houston. HOUSTON – President Trump has today announced the end of Deferred Action for Childhood Arrivals, also known as DACA, within 6 months. DACA provided relief to undocumented immigrants who were brought into the country as young children. Additionally, the Texas Legislature passed Senate Bill 4 in May, which made changes to law enforcement tactics regarding undocumented immigrants within the state. The new law, which was set to go into effect on September 1, has been partially blocked by a federal court due to an injunction stemming from a lawsuit by the Mexican American Legal Defense and Educational Fund. 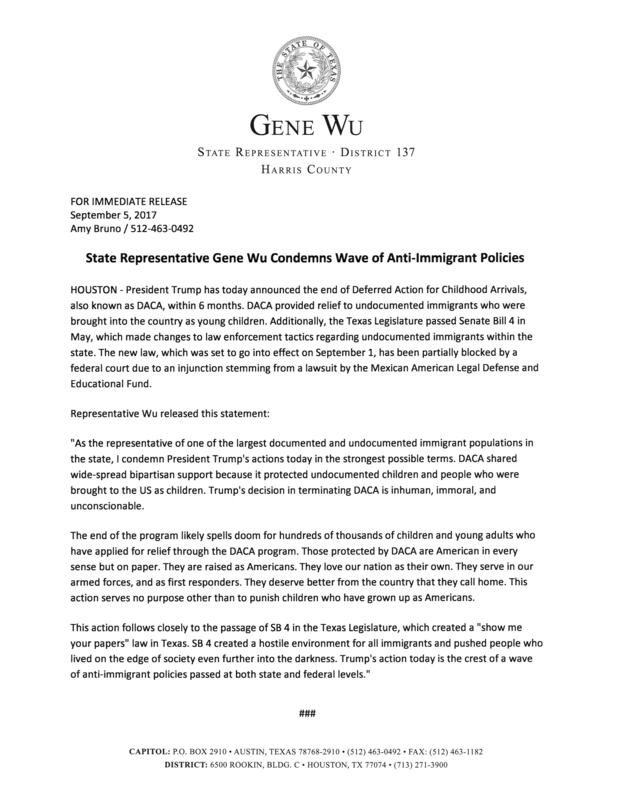 “As the representative of one of the largest documented and undocumented immigrant populations in the state, I condemn President Trump’s actions today in the strongest possible terms. DACA shared wide-spread bipartisan support because it protected undocumented children and people who were brought to the US as children. Trump’s decision in terminating DACA is inhuman, immoral, and unconscionable. The end of the program likely spells doom for hundreds of thousands of children and young adults who have applied for relief through the DACA program. Those protected by DACA are American in every sense but on paper. They are raised as Americans. They love our nation as their own. They serve in our armed forces, and as first responders. They deserve better from the country that they call home. This action serves no purpose other than to punish children who have grown up as Americans. I pray that you and your family, friends and neighbors are safe. As you all know, Harvey has been a catastrophic natural disaster for our city and our state with record-breaking rainfall causing flooding throughout Houston and Harris County, as well as along the central Texas coast. I am extremely grateful to all of our first responders, volunteers and good samaritans who are helping keep fellow Texans and Houstonians safe. The Houston Police Department alone has rescued nearly 3,500 people. My office has been in constant communication with our local city, county, and state officials. Both Judge Ed Emmett and Mayor Sylvester Turner have been working around the clock to provide emergency response, monitor Harvey, and ensure services are being deployed. If you need help, reach out. If you can help, please do. There is much work ahead of us to recover and rebuild. Let’s be good to each other and, as always, be safe. Only call 9-1-1 in a life-threatening emergency if you have an immediate need for medical attention or evacuation assistance. If you can’t get through to 9-1-1 on first try, keep calling. Call 3-1-1 for non-emergency help & information and to report damage, or online at http://www.houstontx.gov/311/. Call 2-1-1 for the Texas/United Way Helpline to access information on shelters and other forms of assistance. This is also a good resource on how to volunteer. Report power outages by phone to CenterPoint Energy at 713-207-2222 or 800-332-7143. The CenterPoint Energy Electric ​Outage Tracker provides approximate locations of current power outages: http://gis.centerpointenergy.com/outagetracker/. Call your insurance agent or company as soon as possible to report property damage. The Texas Department of Insurance (TDI) Help After Harvey website has more information: http://www.tdi.texas.gov/consumer/storms/helpafterharvey.html. If you need information, have a complaint, or can’t locate your agent or company, call the TDI Consumer Help Line at 1-800-252-3439. The Help Line is open from 8 a.m. to 8 p.m. Monday to Friday and 8 a.m. to 5 p.m. Saturday and Sunday. Apply for FEMA disaster assistance: disasterassistance.gov or call 800-462-7585. The State Bar of Texas is offering a free legal hotline and disaster relief resources for Hurricane Harvey survivors at (800) 504-7030 or texasbar.com/disasters. Check Houston Transtar for incidents and road closures due to high water: http://traffic.houstontranstar.org/roadclosures/#highwater. Check Harris County Flood Control District Flood Warning System to view rainfall totals in your area: https://www.harriscountyfws.org/. Volunteer at an emergency shelter or distribution center. 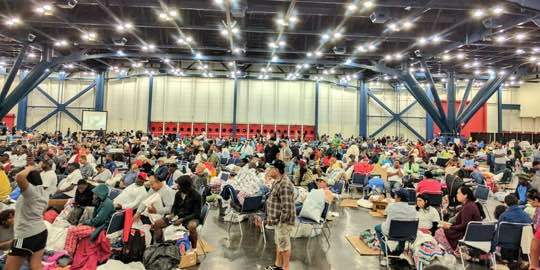 The City of Houston, Harris County and Red Cross have partnered to provide shelter to those displaced by flooding. Check here for an updated list of available shelters: http://www.houstonemergency.org/shelters/. Note:The City of Houston, Harris County and the Red Cross have partnered to provide shelter to those displaced by flooding. Check here for an updated list of available shelters: http://www.houstonemergency.org/shelters/. IMPORTANT: No immigration status checks or requests for papers at any shelter, according to local city and county officials, as well as federal officials at ICE and CBP. 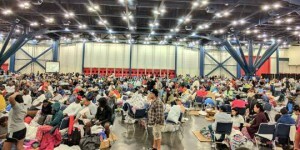 George R. Brown Convention Center, NRG Center, Toyota Center and BBVA Compass Stadium are no longer accepting donations. As Hurricane Harvey makes its way to our coast, please be prepared. Meteorologists predict Harvey to make landfall on Friday night and we can expect heavy rains and flooding, or even worse. Because your safety is my primary concern, I want to make sure you have as much helpful information as possible. If there is any assistance we can provide, don’t hesitate to contact us at our Capitol Office: 512-463-0492. Monitor your local TV and radio stations. Fuel your vehicles and generators. Check your disaster supply kit. Moor boats to a safe and secure place. Fill bathtubs and all available containers with water. Turn off utilities, if requested. the lower level of your house, away from windows. Cover yourself and family members with a mattress or a dining room table to protect yourself from falling debris. I need your help to continue the fight! The 85th Regular Session is now behind us, and while it was challenging, we did make progress in some very important issue areas. My proudest achievement was creating and passing a bipartisan, comprehensive Child Protective Services (CPS) reform bill, which will improve the court process for CPS cases and ease the burden on children, families and child welfare stakeholders. We also passed criminal justice reforms to make the system more fair, and worked on measures to strengthen our community and address local issues in our county, city and neighborhoods. But much of the work we did was about standing up for what’s right. Many of you saw me fight for the rights of immigrants on the floor. You saw me fight for the rights of Texas kids. Now, Governor Abbott has called a special session and I need your help to go back to Austin and continue the fight. I’m starting to ramp up my re-election efforts for next year’s campaign and Friday is our first financial filing deadline. I need your help to reach our fundraising goal. We need to raise $9,300 in the next three days, so please contribute to my campaign today. Next year’s election will be vital for Texas, and with your support, I will continue to fight for equality and opportunity for all Texans. Please give today to help me continue this fight for years to come. Thank you so much for your generosity, friendship and support. AUSTIN, TX – Today, with a vote of 31-0, the Texas Senate passed House Bill 7 by Representative Gene Wu (Houston – HD 137). 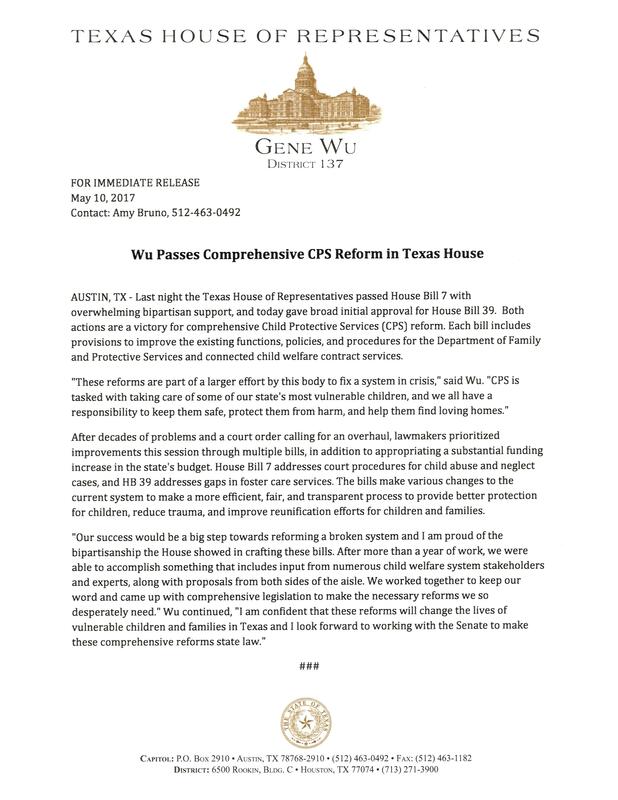 HB 7 is a bipartisan, comprehensive reform of child welfare laws and procedures that will improve the court process for handling Child Protective Services (CPS) cases in the State of Texas. Rep. Wu is a practicing attorney and represents both children and parents in CPS cases. During the interim Rep. Wu gathered input from judges, attorneys, court reporters, state agency staff, advocates, and former foster children to find ways to address problems and improve the system. AUSTIN, TX – Last night the Texas House of Representatives passed House Bill 7 with overwhelming bipartisan support, and today gave broad initial approval for House Bill 39. Both actions are a victory for comprehensive Child Protective Services (CPS) reform. Each bill includes provisions to improve the existing functions, policies, and procedures for the Department of Family and Protective Services and connected child welfare contract services. After decades of problems and a court order calling for an overhaul, lawmakers prioritized improvements this session through multiple bills, in addition to appropriating a substantial funding increase in the state’s budget. House Bill 7 addresses court procedures for child abuse and neglect cases, and HB 39 addresses gaps in foster care services. The bills make various changes to the current system to make a more efficient, fair, and transparent process to provide better protection for children, reduce trauma, and improve reunification efforts for children and families. Today’s passage of Senate Bill 4 is a solution in search of a problem. This is a bill that has been crafted out of fear and hatred of immigrants. Not a single Texas city refuses to comply with voluntary ICE Detainers. Not a single Texas city can be called a “Sanctuary City.” The bill as passed, would not just detain criminals, but would target children, victims of crimes, and even immigrants who served in our armed forces. The Texas Legislature has, today, passed a Arizona-style, “Show-me-your-papers” law that will disproportionately affect communities such as those that make up District 137 — hardworking communities made up of native and non-native Texans, refugees, and immigrants both documented and undocumented. This legislation is cruel. When it was made clear this bill would cause American citizens to be jailed and detained, the proponents of the bill shrugged it off as an unfortunate inconvenience. When Democrats offered amendments to exempt children and victims going to testify in court, those measures were repeatedly defeated on purely party lines. Democrats also asked to exempt religious-based schools who may object with deeply held beliefs; that too was defeated on partisan lines. When I first spoke on this bill I couldn’t stop thinking about my boys. This bill and other laws like it are a constant reminder that, despite being born in this nation, they will be seen as outsiders because of the way they look; that the law will treat them with suspicion; and they will have to fight just to be treated equally. I was reminded that this is not the first time laws were passed against immigrants based on fear and hatred. And, it will not be the last. Democrats were united in their opposition to the legislation because this felt like an attack on the diverse communities that we represent and that make Texas great. At the end of the day, all we asked for was mercy for our communities; mercy for our families; and mercy for our children. But no mercy was given. 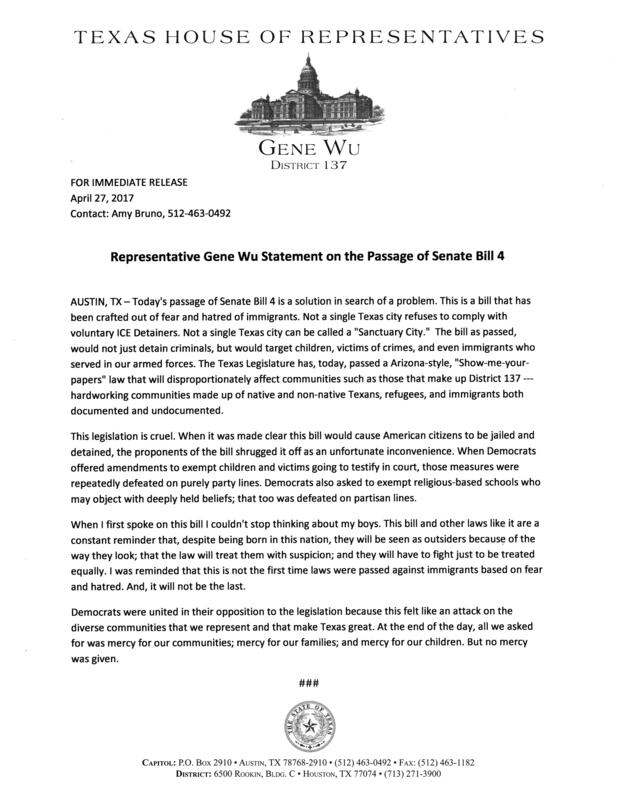 Representative Wu (D – Houston) expressed disappointment that Governor Abbott declared a so-called sanctuary city ban as one of his top priorities in last week’s State of the State Address. Today, the Texas Senate voted to pass Senate Bill 4 (SB 4) on to the Texas House. SB 4 will require Texas law enforcement agencies to collaborate with U.S. Customs and Immigration Enforcement (ICE) to investigate the immigration status of Texans. The bill’s passage follows sixteen hours of emotional testimony in the Senate State Affairs Committee by faith leaders, scholars, lawyers, judges, law enforcement officials, and advocates from all over Texas who oppose this legislation. Over 1 million Houstonians are foreign-born and have contributed $116.5 billion to the city’s economy, according to 2014 data. Considered Houston’s ‘Ellis Island’, Wu represents District 137 in Southwest Houston, where many immigrant and refugee families live and work, and more than 67% of the district’s population speak a language other than English at home. 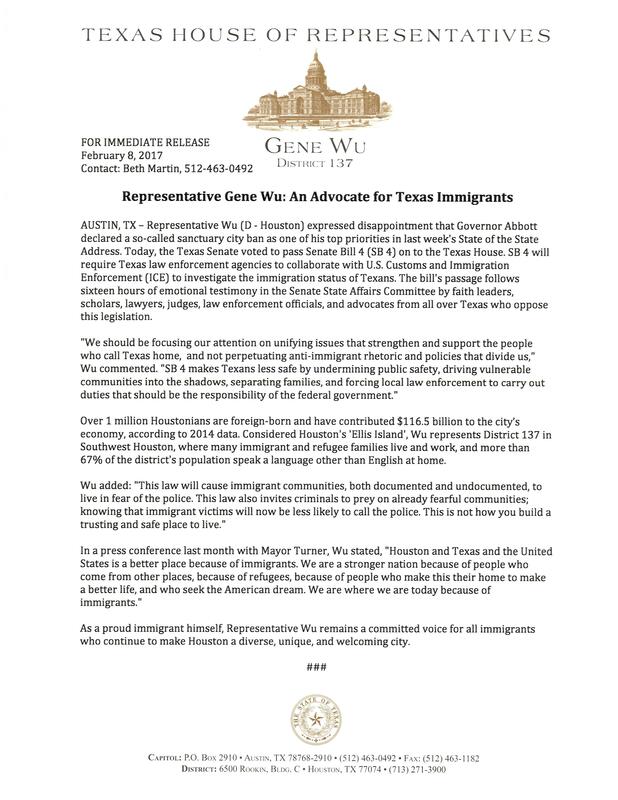 As a proud immigrant himself, Representative Wu remains a committed voice for all immigrants who continue to make Houston a diverse, unique, and welcoming city. 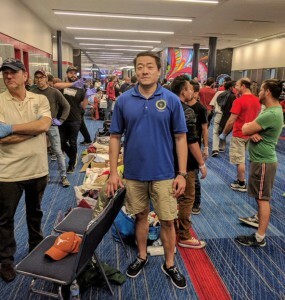 Raised in Sharpstown, State Representative Gene Wu has been active in improving his community. Gene has devoted countless hours tutoring at-risk youth in programs at Sharpstown High School, mentoring adults in the Skills for Living program, and conducting monthly workshops for residents seeking US citizenship.